With a round to go, Ray Robson has 7.5/10 and is in medal contention in the Boys U12 section of the World Youth Championship (Batumi,Georgia October 19-28). In the final round tomorrow, he is on board two with Black against Nyzhnyk Illya from Ukraine. Our other twenty representatives are playing well, and most have plus scores or the chance to achieve them with last round wins. 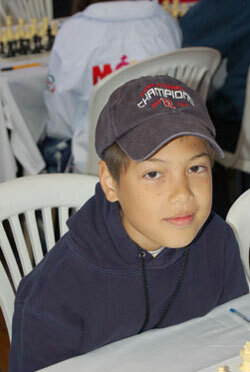 Joel Banawa, playing in the Boys U18 is on a solid plus one, after a pair of consecutive wins in rounds 7 and 8. His stunning victory over David Yang(Canada) features an unusual and effective queen sacrifice. Alisa Melekhina has 6.5/10 in the Girls U16 section. Atulya Shetty, coached by IM Ben Finegold, has 6/10 in the Boys U10. Darwin Yang has 6/10 in the Boys U10. Darrian Robinson has 4/10 in the Girls U12. You can read more about her in this New York Times article or our earlier Chess Life Online piece. Unfortunately, Medina Parilla did not attend as mentioned in both articles. Despite significant fundraising attempts on the part of the chessdrum, there was not quite enough funding for Medina's mom to attend.